Like new actors on Broadway, new products and practices in agriculture have to prove themselves to make it to the big stage. When that stage is the 20 million irrigated acres of the High Plains, many manufacturers and entrepreneurs look to the Irrigation Research Foundation farm in Yuma, Colorado, to get their shot. Precision tools. IRF’s 320-acre farm is monitored by a network of 40 soil probes that use the latest instrumentation to determine the impact a product or practice has above and below the soil. The sensors, installed and monitored by the consulting company AgriMeasures LLC, document the underground condition of soil nutrients, water, and plant roots. “At the IRF we serve to verify and quantify claims made on behalf of products relating to the movement of water into the soil and the use of water and nutrients by plants,” says David Lankford with AgriMeasures. FarmReign’s Luke Cure plans to develop a prescription for IRF’s planter that saves seed by leaving pivot tire tracks unplanted. The farm’s Reinke variable-rate irrigation systems allow water to be targeted to areas as small as 1.2 acres. Reflex irrigation control panels—made by Agri-Inject—on three of the five systems allow fertilizer, fungicides, and other crop inputs to be injected at very precise rates and positions. operating as three, four-row units and is capable of planting dual hybrids at varying rates with the ability to vary fertilizer application rate and position in individual planter rows. 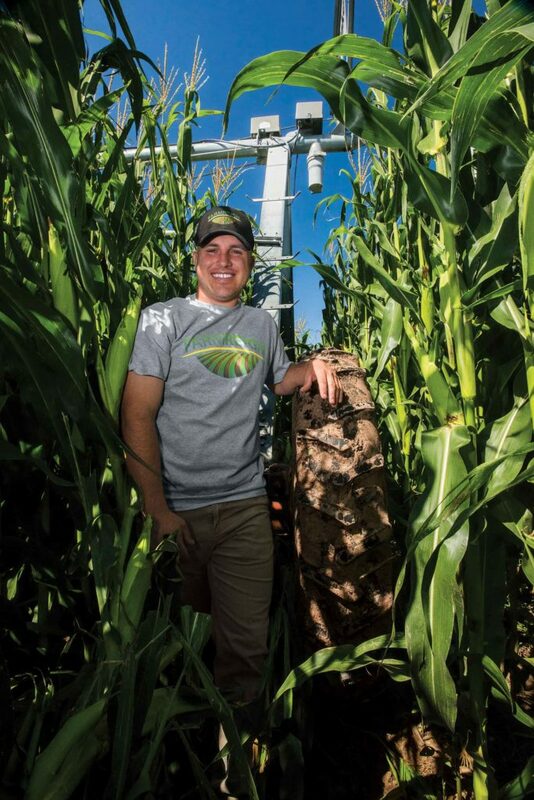 “One row in each four-row section is equipped to provide data on soil temperature, moisture, organic matter level and crop residue in the seed furrow,” says FarmReign’s Luke Cure. Research results. The IRF was founded in 1994 by a group of 30 area producers who took over a former DeKalb seed testing location. “Our research on limited-irrigation generally went unnoticed until the past decade as area growers struggled to comply with a court ruling that Colorado comply with terms of a 1943 water-sharing agreement with neighboring states. While cooperators include major seed and chemical companies, they also include local growers like Nathan Armstrong, who is using the IRF to validate fertilizer savings to promote his custom manure spreading business. Meanwhile, that product that helps the soil breathe—AgpHRx from Nano AG Technologies—showed a 24-bushel per acre advantage in corn.